EduBirdie.com is a cute website. The ‘birdie’ is a bit too blue and Twittery, but cute. The first impression is okay. The prices are low (starting at only $13 per page), and there’s a guarantee for unlimited results. It’s unclear how the website works, but I got that question answered in the FAQ section. Basically, it’s a bidding service. You place an order, few writers bid on it, and you choose your match. It’s not a popular website. It’s relatively new and not many students know about it. The ones I interviewed had no idea this website existed. So, I can’t tell you much about its reputation. We’ll have to give the service a chance to build one, first. As far as I can tell, it has some potential, but it’s not perfect. There are not many types of papers available for order, but you can get any kind of essay, research/term paper, application essay, or coursework. Dissertations are also mentioned, but I wouldn’t risk a project that serious with this service. I couldn’t find anything about the guarantees on the main page. In the terms and conditions section, I found regulations about the messaging system, but no one guarantees that the support will be online 24/7. You can cancel the order when it’s in bidding or in progress status. There’s also something about an admin canceling the order because of a fraud writer. What? A fraud writer? Don’t you test the writers and check their qualifications before you accept them to work for you? Not a good sign for EduBirdie.com. This is a bidding service, with the minimum price set at $13. That’s a really affordable quote per page when you compare it with most other services. I ordered an essay and most writers bid around $15 per page. 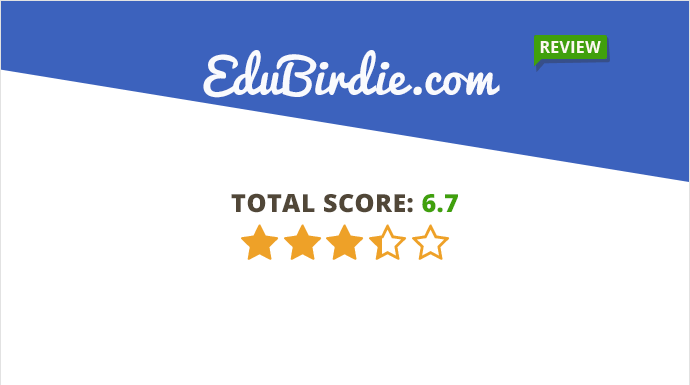 There are no discounts, but EduBirdie is still one of the most affordable services out there. The essay I got was better than expected. It was not impressive. It had some grammar flaws and it looked like something I’ve read before. However, it was not that bad for the price I paid. The communication with the writer was effective. He responded to my messages and I was sure the paper would be ready on time. The customer support department is available, but you don’t need the representatives when you arrange everything with the writer. This was the biggest problem: the writer didn’t provide a reference page for the essay. Most other services provide this part of the paper for free, but that didn’t happen with Edu Birdie. In conclusion, EduBirdie is an okay service. Bidding services are always difficult to review, since a single writer does not represent the quality all others deliver. The paper I got was good for high-school level, but it would get a low score if a college student represented it. The arguments were okay, but there were no references that supported them. Have you used this service? How happy were you with it?